Welcome, Probies! - Blazing Bricks - Emergency Bricks! You've just walked into your fire station on your first day. As an Explorer, Volunteer, or Career firefighter, your career in emergency services begins now. I was there almost 4 years ago. I signed my Explorer Post application, grabbed some gear, and got ready to train for the first time. I knew my responsibilities, I knew the job, and I had the ambition. Here are a few things to expect from your first fire job, and a few things to avoid. Know Your Job: If you're an Explorer or Junior Firefighter, your job is to train and learn. If your post allows you to respond to calls, prepare for that. Train in firefighting of course, but know your BLS skills. More than likely, you'll respond to a good number of medicals before you ever see a fire. If your post does not let you respond, train anyway! That's the job of an Explorer. Know how to take pulses and BPs for rehab. Know your scene assist tasks. Know Your Rig: If you're responding, you have have have to know your truck inside and out. I recently started at Grand Lake Fire in CO for the summer, and first thing I did, even before being cleared to run calls, was memorize my truck. Start with the things you'll need the most: EMS bags, water and ABC cans, hand tools, ground ladders, preconnects and brass (nozzles and fittings), SCBAs and spare bottles (These are very important to know, whether you are exterior, interior, or support staff). Then move onto the lesser-used things: Haz-Mat equipment, absorbents, rescue tools, rope rescue gear, etc. If you memorize your rig you'll be much better off starting out. 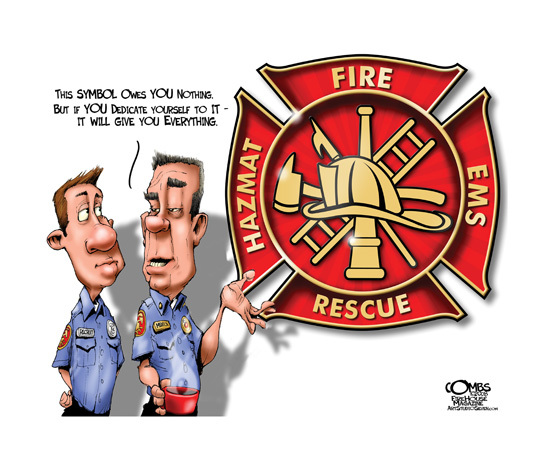 And don't stick to just one rig, make sure you can locate the PPV on the Ladder, the Denver bar on the second due Engine, the haz-mat gear on the Rescue, the command board in the Chief's vehicle... Know all of it. Train Like Your Life Depends On It: It does. Firefighters, train hard and train every day, for every scenario. Station Pride posted an article a while back detailing how to train to respond to the unimaginable. It may seem silly or pointless, but trust me from experience: there is no "routine" shift, or day on the job. Saturday nightshift on the ambulance, expecting many alcohol-related calls, responded to an evisceration stabbing less than a block from quarters. There. Is. No. Such. Thing. As. A. Routine. Shift. Our profession is chaotic, and we all need to do better preparing for the thing we never expect. Train train train! Don't be "That Guy": There's one in every firehouse. Eventually, you'll understand what I mean. Don't try to act above your knowledge or skill level. Don't be a know-it-all. It's okay to know it all, but remember that someone will always know more than you, and there is always more to learn. It's also okay to say "Well, I haven't done this before, and it makes me a little nervous, but I'll give it a try!". Strive to do more, learn more, be more. Ask to try new things. Ask to try a different riding position. Show the initiative and you will be held in high regard. But make sure you are competent in your current duties before trying to advance. Pranks And Hazing: Oh yes, there will be pranks. Some fire service traditions never die. A little pranking and good-hearted joking is all okay and all in good fun. BUT there are some pranks that I feel cross a line. One is pranks involving gear. A while ago, a female firefighter found her boots filled with water as a part of a prank. Think about what could have happened if they dropped a call and she had to wear those boots inside a structure? Steam burns are nothing to joke about. The gear we wear is designed to save our lives. If you feel like a prank crosses a line of safety, or makes you feel uncomfortable or unwelcome, speak up. TL;DR? Do not mess with gear. Do not put others at unnecessary risks with pranks. Do not be afraid to speak up if a prank crosses the line. Pride: My first helmet was a red leather Lion American Heritage. Throughout 3 years in the department, I made it my own. Swapping out my Bourkes for clearer, unscratched ones; adding stickers and new tets, polishing my brass eagle, keeping my leather helmet shield and leather helmet in good condition, even giving it my own signature bend. I often got asked by fellow Explorers why I did so much to my lid, and often picked up some teasing for it. But it's a good question: why did I do it all? Well, it's the same reason we almost religiously clean and polish our trucks, and go to shows and parades. It's all about pride in the Job. With the fire service comes a certain pride in the work you're doing, never let your Pride in the job die. (But never let your pride get you into trouble. Don't be afraid to call the mayday or give you a big head). Brotherhood: "In this Brotherhood, no one fights alone". We go in together, and we come out together. Someone always has your back. It becomes an unspoken bond, a band of brothers, if you will. The fire service is built on Brotherhood, and it is still as present today as it ever has been. Embrace it. If You Don't Know...: Ask! There will always be someone wiling to be your mentor or give you advice and tips, or even just answer simple questions. We all start somewhere. Eventually you will stop calling it a Fire Station "because everyone knows that they aren't called firehouses anymore! ", and you will call it a firehouse. It will become your second home, and your Brothers and Sisters will become your second family. You'll know their lives, their kids' names, what they like to do on their days off, and they will know yours. You'll stay an hour after a twenty-minute call just to talk to your old friends you haven't seen in a while and shoot the bull. Fire will be a part of your life forever, even if you decide to take a different path in life later on. Welcome to the Brotherhood, probies. Let's get to work. James is a 4-year member of the LFC, and currently studies Natural Resources Management at SUNY-ESF in Syracuse, NY. James is a certified Type 2 Wildland Firefighter, Hazardous Materials Technician, and Driver/Attendant and EMT Student at Syracuse University EMS. James has worked for three fire departments and one EMS agency in his 4 years in emergency services. James is entering his 5th year in Fire & EMS in November 2015. This is a very well written and brings up memories from my months as a probie, both career and volunteer. Witch is 9 years ago, and I'm feeling old. And extremely good tips for a starting emergency services member. Even for probies outside the US this could be a good guide on the basic do's and dont's. Things Are Not Standardized: You might do things differently in a new department, different state, or than how you run your own Lego department. Just because you do something a certain way doesn't mean it is the right or only way to do it. This is worthy of repeating: Just because you do something a certain way doesn't mean it is the right or only way to do it. I may have rescue tools on my tanker, and you may not. I am not right and you are not wrong, it is just how it is. Take The *** Advice: If someone who has been on longer than you, who is older and wiser than you, or just someone who knows more than you do gives you advice, take it! It's a valuable resource, and it will help you in the long run. Pretending you know everything (In the LFC or in real life, just makes other people annoyed and less willing to help later on. Always a pleasure to read your writing james. One thing I'd personally add, •personal tools. Good write up. A lot of that advice carries to any job/career/duty/whatever. In this service, the stakes are higher, so pay attention at all time.